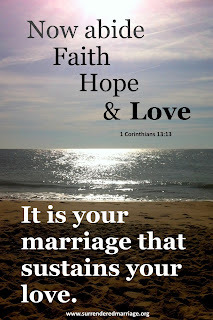 I'm concluding my Faith, Hope & Love Series today with a post about love. Sitting down to write this post I feel the difficulty of the task before me. How do you write a single post about love in marriage that isn't a 10,000 word treatise, a theological expose' or a concise summary filled with trite sayings? Impossible? Maybe. But here's my shot at it. The whole chapter of 1 Corinthians 13 describes in great detail what love should look like. Most of us are well-acquainted with the words of the famous love chapter. Love is patient, kind and believes for the best. It is never jealous or rude or selfish. I'm madly in love with my wife, yet I sometimes lose patience, say unkind things and behave selfishly. So to me, love is more than a set of good behaviors. It is possible to love deeply and yet fail miserably at showing it from time to time. There must be more to love than "doing the right things." I don't usually take marriage advice from people who have never been married. I make one notable exception, Dietrich Bonhoeffer. Bonhoeffer was a German Lutheran pastor, theologian, and staunch anti-Nazi dissident. The latter caused his imprisonment and eventual execution while he was engaged to his beloved Maria. We have all heard the adage, "Love is more than a feeling." Here, Bonhoeffer takes that notion one step further. He is saying that we cannot count on the feelings of love to carry our marriage through. Feelings can be fickle and deceiving. But he adds to that the notion that love must be sustained, and what sustains love, according to Bonhoeffer, is your marriage. It is marriage, that supernatural holy covenant union of two becoming one before God and man, that keeps love alive. A Marriage That Sustains Love? 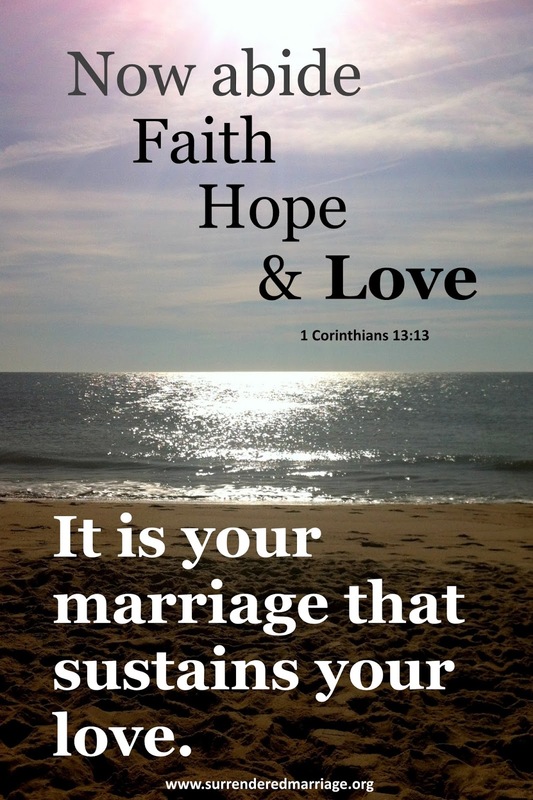 How do you ensure that your marriage sustains the love in your relationship? Sustaining love comes down to a daily choice - actually multiple choices - to serve and bless each other, even when you don't feel like it. While there are dozens of ways to keep your love strong, here are three keys that will take you a long way toward lasting love. 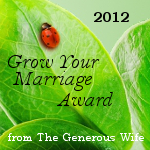 1) See your marriage and your spouse as gifts from God. Rather than look at your marriage as a problem (or set of problems) to be solved, focus and be thankful for the good parts. Even in the most difficult marriages, there are small gems that you can dig out if you look for them. Whatever you focus on will grow, so focus on the good stuff. It's not living in denial to be thankful for to good in your marriage and in your spouse. You can be thankful and still work on the problems - the two are not mutually exclusive. In fact, a thankful attitude will actually do more to smooth out the troubled parts than will a bitter, resentful attitude. Your marriage is not a competition, so don't look at it that way. Instead, remember that when you got married, you and your spouse actually became one. The notion of two becoming one is what the Apostle Paul describes as "a great mystery." 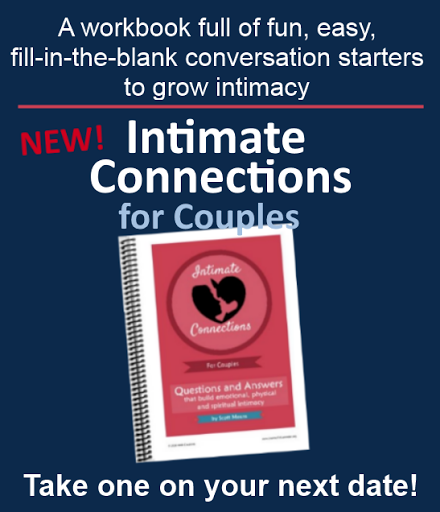 Even if it doesn't feel like it, you two are one, so why not enjoy the benefits of being one with your spouse. When you start to live in the reality of your oneness, score-keeping, battles for control and retribution make no sense. When you believe that you are one, self-focus gives way to other-focus and couple-focus. For more implications of what it means to enjoy the fruit of the one flesh reality you share, see "What If You and Your Spouse Really Are One?" Are you afraid that being one means giving up your individuality? It doesn't mean that at all. Read my "One Flesh: Unity and Individuality" post, and set your mind at ease. Never stop pursuing each other. Never. Jenni and I have just celebrated our 33rd wedding anniversary, but we both know that we still need to pursue each other. Every day. The problem most people have with pursuit is that we tend to pursue our spouse in the way we want to be pursued. That rarely works out well, because men and women tend to define pursuit differently. In order to pursue well, you have to become a student of your spouse. It takes some effort and a bit of trial and error, but there is a huge payoff! The payoff is a marriage that sustains love and passion. Pursuing your spouse says to him or her, "I still choose you." It also says, "I am willing to do whatever it takes to have you and to keep you." 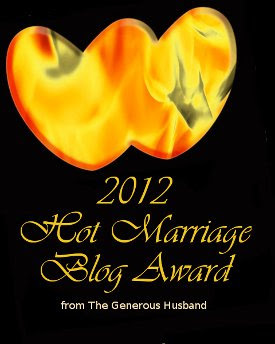 For more on pursuing your spouse, see my posts on relentless pursuit for husbands and for wives. What would you add to these three keys that sustain love? 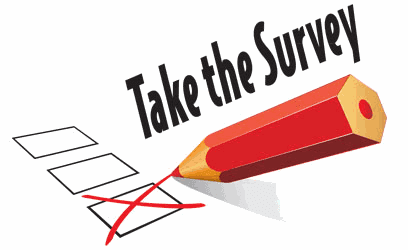 What do you do to ensure that your marriage sustains the love in your relationship? Leave a comment.